Polishing Machine Single Disc, VARIABLE SPEED PORTABLE TYPE - It is compact complete unit with independent driving motor, speed change arrangement, swan neck tap, drain pot, guard, cover and ON/OFF switch. Thus in this machine you have a low priced compact versatile polishing arrangement requiring minimum of maintenance in your laboratory. Portable table top model having stainless steel sink with built in drain pot and sink area and fitted with swan neck tap. The drive is of a 1/4 H.P. T.E.F.C., 220 Volts AC, single phase Motor employing a continuously variable speed mechanism giving speed from 300 to 900 RPM approximately. The disc of 8\" dia. bronze push fits on a tapered steel spindle. The spindle runs freely in two ball bearing fitted in the housing. The change of speed is made with the help of a circular control wheel. The machine is supplied with splash guard/ hand rest. disc cover and cloth clamping ring for fixing cloths. Paper clamping ring for fixing papers on the disc, as extra accessory is available. OR -DO- similar to above but with bigger sink for 10\"bronze disc and is provided with 1/2 H.P. 220 V AC., T.E.F.C., single phase motor. Double Disc, The machine consists basically of two independent 1/4 HP motor driven two 8\" bronze disc over which polishing paper of cloth can be stretched. The discs are easily replaceable, the machine is supplied with two 8\" bronze disc which push fits on a tapered steel spindle which runs freely between two ball bearings fitted in the housing, Motors are mounted on a common M.S. frame. The discs operate in basin of fiberglass, which collects the abrasive wastes and removes them out of the system. The discs are also provided with splashguard and cover for protection when not in use. 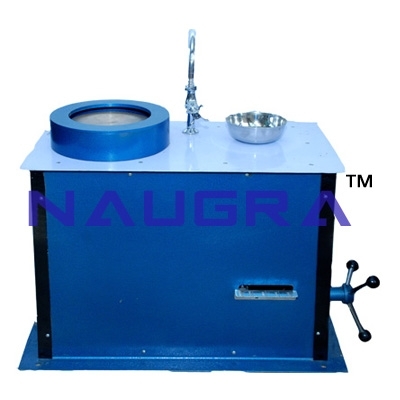 The machine is also provided with swan neck tap, which can be swung on the disc for controlled addition of water during grinding and polishing or swung on to a wash basin for washing the specimen during intermediate examinations. The whole unit is a self contained table with easy accessibility to mechanism. All controls are brought to the front for ease of operation. The machine operates on 220 V AC with a 1/4 H.P., T.E.F.C., single phase motor which provides continuously variable speed from 300 rpm to 900 rpm by means of a circular control wheel. OR -DO- similar to above but with 2 bigger sinks for 10\" bronze discs provided with 1/2 H.P., T.E.F.C., 220 V AC single phase motor..
We are leading manufacturers, suppliers & exporters of Polishing Machine. Contact us to get high quality designed Polishing Machine for schools, colleges, universities, research labs, laboratories and various industries. We accept bulk orders for government tenders in all countries around the globe.